From vinyls, to cassette, to CDs, music has always lived within a physical support. But nowadays music is in your pocket, in your laptop, in the air. You only need a sound system to amplify the waves that make you rock/vibrate. As a music addict I’ve always been trying to take music everywhere. From a young age I went everywhere together with my radio cassette, as well as a bag full of batteries and cassettes to score anywhere I was. I’ve always needed the sound of the music as everyone needs to breathe air. As a consequence of this BounceyBox came to life in 2015 in Barcelona. 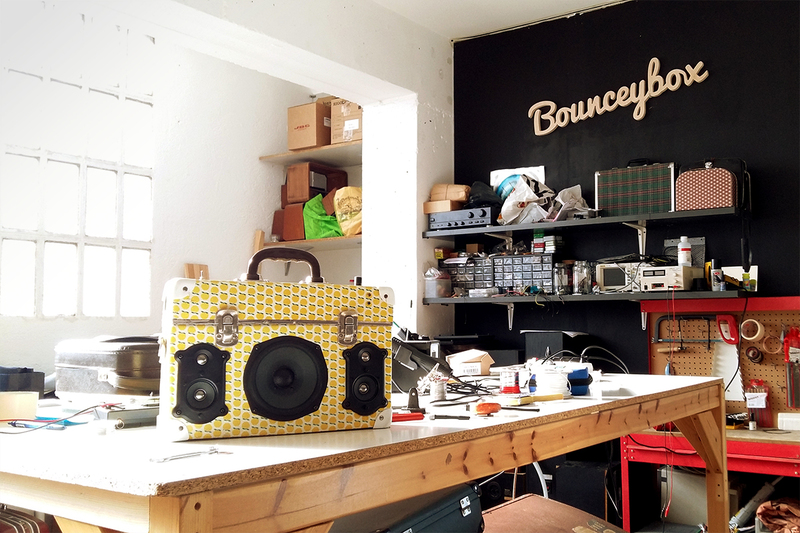 Every Bounceybox is handcrafted with selective materials, built into vintage objects (luggages, cases, furniture…), powered with high quality amplifiers and drivers. They are portable, rechargeable, just plug or pair – with bluetooth – your phone or laptop, and you will be ready to party anywhere, anytime!